This trail is approximately 15 kms of rail bed available to hikers, skiers, bikers, ATVs, and skidoos. 3 km north of the community Cow Head. 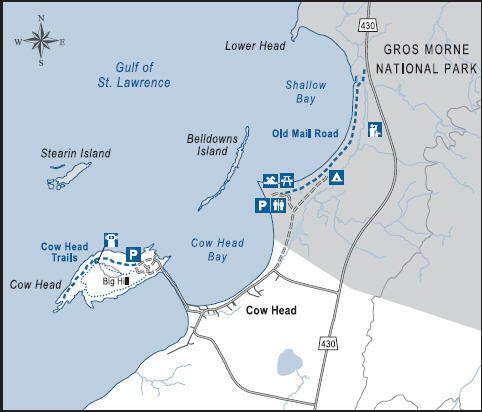 This trail starts at the Shallow Bay day-use area and follows the old winter mail road along the edge of the campground, and north to the Slants River. The mail road parallels the shoreline in the shelter of dense coastal forest. For a short loop, you can cross the dunes on the boardwalk at the campground and then return along the beach.